"While part of the control electronics is not integrated yet, the device we designed integrates all the required optical components on one chip," said first author Francesco Raffaelli, University of Bristol, United Kingdom. "Using this device by itself or integrating it into other portable devices would be very useful in the future to make our information more secure and to better protect our privacy." Random number generators are used to encrypt data transmitted during digital transactions such as buying products online or sending a secure e-mail. Today's random number generators are based on computer algorithms, which can leave data vulnerable if hackers figure out the algorithm used. "Compared to other integrated quantum random number generators demonstrated recently, ours can accomplish very high generation rates with relatively low optical powers," said Raffaelli. "Using less power to produce random numbers helps avoid problems such as excess heat on the chip." The new chip was enabled by developments in silicon photonics technology, which uses the same semiconductor fabrication techniques used to make computer chips to fabricate optical components in silicon. It is now possible to fabricate waveguides into silicon that can guide light through the chip without losing the light energy along the way. These waveguides can be integrated onto a chip with electronics and integrated detectors that operate at very high speeds to convert the light signals into information. The new chip-based random number generator takes advantage of the fact that under certain conditions a laser will emit photons randomly. The device converts these photons into optical power using a tiny device called an interferometer. Very small photodetectors integrated into the same chip then detect the optical power and convert it into a voltage that can be turned into random numbers. "Despite the advancements in silicon photonics, there is still light lost inside the chip, which leads to very little light reaching the detectors," said Raffaelli. 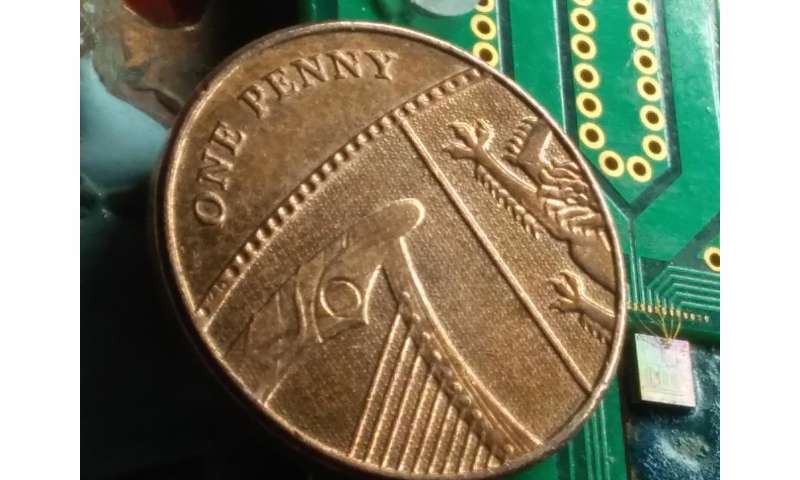 "This required us to optimize all the parameters very precisely and design low noise electronics to detect the optical signal inside the chip." The new chip-based device not only brings portability advantages but is also more stable than the same device made using bulk optics. This is because interferometers are very sensitive to environmental conditions such as temperature and it is easier to control the temperature of a small chip. It is also far easier to precisely reproduce thousands of identical chips using semiconductor fabrication, whereas reproducing the necessary precision with bulk optics is more difficult. To experimentally test their design, the researchers had a foundry fabricate the random number generator chip. After characterizing the optical and electronic performance, they used it for random number generation. They estimate a potential randomness generation rate of nearly 2.8 gigabits per second for their device, which would be fast enough to enable real-time encryption. "We demonstrated random number generation using about a tenth of the power used in other chip-based quantum random number generator devices," said Raffaelli. "Our work shows the feasibility of this type of integrated platform." Although the chip containing the optical components is only one millimeter square, the researchers used an external laser which provides the source of randomness and electronics and measurement tools that required an optical table. They are now working to create a portable device about the size of a mobile phone that contains both the chip and the necessary electronics.